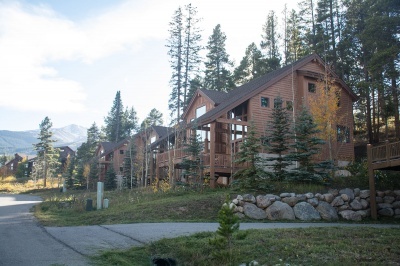 Located on quiet Sawmill Road just a block above downtown Breckenridge, the Saw Mill Patch townhomes for sale are more than just close to town. The townhouses back onto the Skyway Skiway that links Peak 8 of the Breckenridge Ski Resort to the base of the gondola, and are a short walk from Four O’clock Run. They have been maintained at a very-high level of interior finish, exterior curb appeal, and sales price because of their excellent location. Discover more about the beautiful, well-located homes in this Breckenridge community, or check out the Sawmill Patch townhouse listings below. Sawmill Road dead ends into the Four O’clock ski run and gives trail access to town and the national forest, and ski-in convenience. These ‘Patch townhouses also have access to the gondola ski-back trail that is maintained, kept snow covered, and known as the skiway. From Peak 8, Four O’clock Run has long been a gentle way to ski to town and the homes along it. Just before the last pitch of Four O’clock, skiers can now also take the Skyway Skiway, which crosses over Ski Hill Road and lead to condos and homes on the northside. The skyway ends with a tunnel under Park Avenue that comes up in the parking lot of the town-terminal of the gondola. Via the gondola, you can get back to the base of either Peak 7 or 8. The Sawmill Patch Townhomes were built in 1991 and are typical for homes built in Breckenridge at this time. They have wood exteriors, a spilt-level entry, with small basements and a garage, living area just above the entry and bedrooms above. The large geometric quilt of windows in the living room is also a sign of those times. Amenities: on the ski trail from Peak 8, walking distance to the downtown trails, garage and 2 have garden level basement. From the traffic circle on the north side of Breckenridge exit onto Park Avenue and continue about .5 mile Ski Hill Road, turn right and continue uphill. Turn left onto Sawmill Road, and the Sawmill Patch Townhomes will be on the right after the Ski Club and Breckenridge Christian Ministries.